Lawfare is the exploitation of courts in democratic countries in order to harass Israeli officials with civil lawsuits and criminal investigations for “war crimes,” “crimes against humanity,” and other alleged violations of international law. While NGOs claim these cases are about obtaining “justice” for Palestinian victims, they are actually part of the larger political war against Israel. The tactic of lawfare was adopted at the NGO Forum of the 2001 Durban Conference, and is an integral part of the Durban Strategy which seeks to demonize and delegitimize Israel. Although Israel is not the only country that has been subject to lawfare (the US and England have also been subject to suits arising out of the Iraq war), Israel is a primary target. NGOs exploit universal jurisdiction statutes in Europe and North America to bring these cases. These statutes allow courts to preside even though the parties and events at issue are entirely foreign. In some countries, such as the UK, an NGO can apply to a court directly for an arrest warrant or to launch a criminal investigation without the knowledge or approval of the government. The NGOs leading anti-Israel lawfare are the Palestinian Center for Human Rights, FIDH, the Center for Constitutional Rights (New York), Al-Haq, and Adalah. 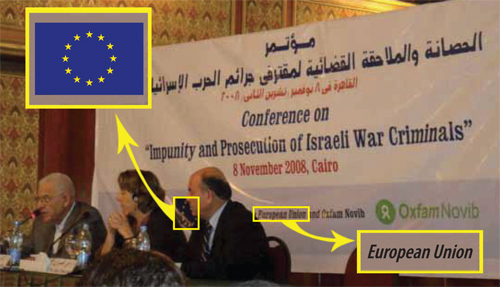 These organizations are funded by the EU, European governments (Ireland, Norway, Sweden, Denmark), and prominent foundations such as the New Israel Fund, the Ford Foundation and the Open Society Institute.